Spotted by developer David Barnard, who shared the discovery in a tweet on Thursday, Apple's new policy forces users to jump through an extra hoop when downloading a subscription-based app or opting to purchase a subscription in a free-to-use app. The system inserts a new "Confirm Subscription" pop-up notification after the usual App Store purchase page. Previously, users were able to — perhaps too quickly — commit to an in-app subscription by tapping on a button and confirming the purchase with Face ID, Touch ID or passcode. Now, tapping the same button brings up the usual App Store purchase prompt, but further requires users to interact with a follow-up confirmation window before the subscription is processed. "This subscription will continue unless canceled in Settings at least one day before the subscription period ends," the message reads. Users must tap "OK" to proceed with the transaction, offering one final chance to cancel if the subscription was made in error. 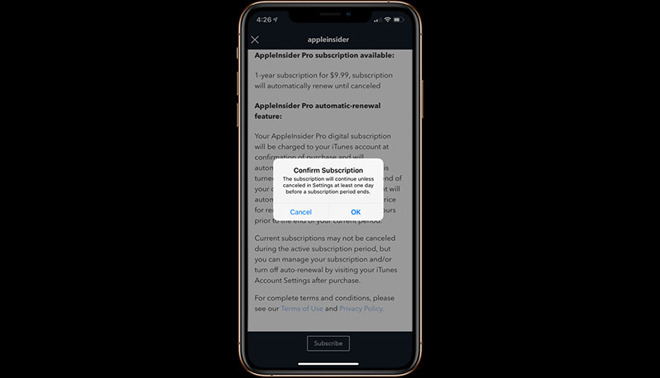 This extra step is thought to be an effort to stymie apps designed to take advantage of Apple's subscription purchase mechanism. Last October, a report highlighted a growing problem that saw "scammers" craft apps with the intent to dupe customers into signing up for recurring subscriptions. Unscrupulous app makers were found to use intentionally deceptive user interface elements, "dark pattens" and other strategies to confuse or trick customers into starting convertible trials. For example, one app pushed users to upgrade to a "Pro Version" by tapping a large "start" button that disguised monthly pricing information in small font. Once activated, users were committed to a three-day free trial that auto-converted to a $3.99 per month subscription. At the time, Apple addressed the issue by removing offending apps from the App Store, but in retrospect the policy appears to have been a stopgap solution. The new confirmation alert, while not elegant, at least provides iOS users an extra layer of security against would-be scammers.